Charlotte's hair is blonde!!! - Vice President-elect Mike Pence and his family departed Indianapolis with pets in hand Monday for what his aides described as the “final time” before his inauguration next week in Washington D.C. For the first time, he and his family flew in a U.S. Air Force passenger jet rather than a Trump campaign airplane. The government plane, its side emblazoned with “United States of America,” will be known as Air Force Two after Pence takes office Jan. 20. Pence’s wife, Karen, and his daughter, Charlotte, carried the family’s cats, Oreo and Pickle, as they boarded the airplane. Their rabbit, Marlon Bundo, was also carried aboard in a cage. The Pences will move into the vice president’s residence at the Naval Observatory after the inauguration. The family has been renting a house in Chevy Chase, Md. Senate Majority Leader Mitch McConnell said Monday he’s still hoping to confirm President-elect Donald Trump’s national security Cabinet picks on Jan. 20, just after the new president is sworn in. After meeting with Mr. Trump in New York, Mr. McConnell emerged to say Republicans will give all the nominees scrutiny, but he’s pushing to have at least a half-dozen of them ready to go in less than two weeks. “Everybody will be properly vetted as they have been in the past, and I’m hopeful that we’ll get up to six or seven — particularly national security team in place — on day one,” the Kentucky Republican told reporters. Mr. Trump himself also said he’s pleased with the pace on Capitol Hill, saying he expects all of his picks to be approved. Trump hosted Univision Communications Inc's chief executive officer Randy Falco and Univision's director of News, Entertainment and Digital, Isaac Lee, with whom he met for about 40 minutes. "We had a wonderful meeting, very productive. President-elect Donald Trump is very interested in all issues affecting our community and is committed to speaking to our community, "Falco told reporters at the meeting, who are stationed in the lobby of Trump Tower. "We talk about our community's interest in jobs, opportunities ... we have a lot of common ground in that area and he is eager to go ahead and maintain that conversation. Our position is that we are promoters of our community, we make that clear, and he made it clear that he is the promoter of all Americans." President–elect Donald J. Trump released the following statement at the conclusion of the meeting with Intelligence Community leaders: “I had a constructive meeting and conversation with the leaders of the Intelligence Community this afternoon. I have tremendous respect for the work and service done by the men and women of this community to our great nation. “Whether it is our government, organizations, associations or businesses we need to aggressively combat and stop cyberattacks. I will appoint a team to give me a plan within 90 days of taking office. Seriously. Free weed. #Trump420 The time of Trump is nigh. 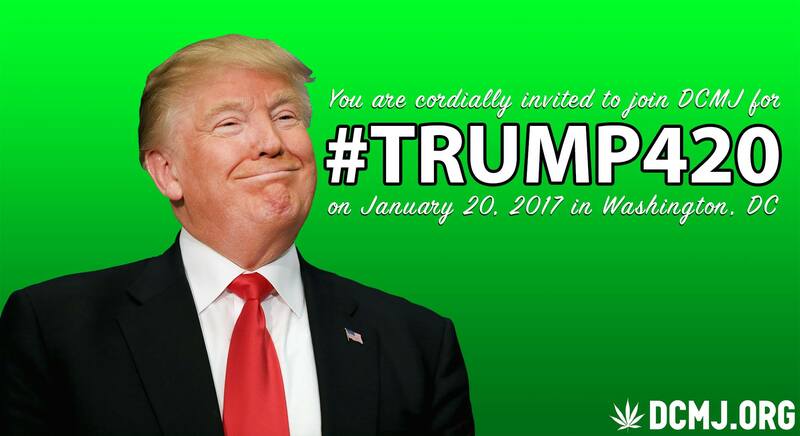 The pro-cannabis activist group DCMJ is giving out 4,200 joints on Inauguration Day The group is organizing a massive “smoke in” at exactly four minutes and twenty seconds into Donald Trump’s speech. The group doesn’t consider this a protest of the Trump presidency. Instead, it’s “about raising awareness about cannabis reform and getting Trump to support the full legalization of cannabis throughout the United States.” Their goal is to get the new president to commit to federal legalization of marijuana. Marijuana is technically legal in Washington DC, but anyone smoking in public still runs the risk of getting arrested. No matter what happens, Inauguration Day is going to smell dank as hell. The Trump-Pence Presidential Transition Team today announced the build out of the White House policy team. The Domestic Policy Director and Council will report to the Senior Advisor to the President for Policy, Stephen Miller. All members of the policy team will be required to accept a five-year ban on lobbying after the conclusion of their service as well as a lifetime ban on becoming registered lobbyists for a foreign government. “These knowledgeable, skilled and talented experts will make enormous contributions to the President-Elect’s America First agenda,” said incoming White House Chief of Staff Reince Priebus. The White House Domestic Policy Council will oversee issue areas including judiciary, budget, public safety, education and immigration policy, and will focus its efforts around the goal of increasing economic prosperity and protecting and defending the American worker and wage earner, particularly those who have been underserved.